Director: Daniel Benmayor / Writer: Mario Schoendorff / Cast: Jennifer Matter, Brendan Mackey, Patrick Regis, Iaione Perez, Neil Maskell, Anna Casas, Peter Vives Newey, Claudia Bassols, Felix Pring. If you’ve ever been paintballing it’s likely you’ve encountered some the archetypes commonly associated with shooting-things-for-fun. I went a couple of years ago and we beheld the stag-do lads (the groom was made to wear a dress) and the militia wannabes who like to take such things a tad seriously… Needless to say, I was crap as it, succeeding only in eliminating trees from the competition. In the grand tradition of doing-what-it-says-on-the-box, Paintball is a film about paintball – an obvious development for death-in-the-woods film, but not one that hasn’t been explored before. Jason took out some dorky execs in Friday the 13th Part VI and bachelor-party-boneheads were hunted by a Templar Knight in StagKnight just a couple of years back. This Spanish film (in English) puts eight international paintball fanatics – four of each gender – into Redball Woods, “Europe’s largest paintball sanctuary” where they’re given 24 hours to capture four flags and annihilate the opposing team. Names are bandied around but with everyone in masks it’s impossible to work out who’s who and all dialogue for now is yelled commands from nominated leader David. Before long, the team are attacked by someone who has better weapons than they do – including real bullets it seems as one lagging schmuck is quickly killed off. So begins their plight as a largely off-camera hunter picks them off one after the other, watching through night-vision goggles so all the violence is polarised and spurts of blood appear bright white. At around the halfway point, Paintball does the opposite to what most modern horror flicks do – it gets better instead of worse, escalating steadily towards the interesting climax. The first third was crowded with annoying characters (we had the token fat American guy, the brash sub-Vasquez chick, and the black guy) and had frenetic, near impossible to watch camera work. However, it soon becomes apparent that we’re not dealing with just another I-hate-people psycho; the killer is under instruction from a group of people with a vested interest in watching people die. Echoes of Battle Royale, Wilderness and now Hostel come together as the final numbers dwindle and the killer rebels and decides to kill his way, leaving last survivor – female, natch – to be ‘adopted’ by the controllers, who shepherd both her and the killer together for a final theatrical confrontation. The winner will be granted freedom…right? 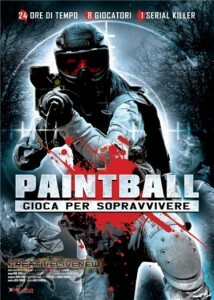 In spite of some nice accents, there’s little European flavour in Paintball: none of the lush photography that made The Orphanage so nice and sod all tension a la Cold Prey and Haute Tension. But there is something good about it, something that might have worked out better if the film were in more experienced hands. As it is, the first third is so dismal that the temptation to turn off was overwhelming. If you can make it to the midway twist, you might enjoy it.